Are you starting to detect a trend here? Many of the pics on this site are from one location. 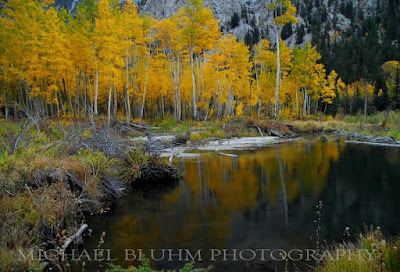 This basin has yielded a number of wonderful subjects for me to capture on film and card. This image, I feel, typifies the look and atmosphere of the area; the place I like to call Colorado's Garden of Eden. The peaks in the distance are Mt. Sneffels and Kismet Mountain. Twin Falls are just below in this view. Whitney Houston - what can I say? When she was still a teenager, she quickly became a singing phenomenon. It is now 3:17 in the afternoon and the temperature is a balmy 22 degrees Fahrenheit. I was born in July just south of L.A., and winter and I don't cotton to one another. Still, I love Colorado more than any other place. I have to admit though I wouldn't mind visiting a warmer climate right now! Latins like Enrique Iglesias and songs like the one in this video help take me far, far away to a warmer place.....in my mind. COMMENT: The arching branches of the juniper offered a frame for the landmark rock in the distance. 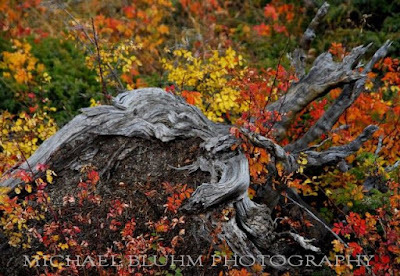 This is the image referred to below as being selected as a finalist in Outdoor Photographer magazine's photo contest. I recently entered my first photo contest! It was with Outdoor Photographer Magazine. The contest was Celebrate the Seasons and out of around 4700 entries, I am a finalist in a group of sixty. There are many great photos I'm competing against, but if you would like to vote for me for the Peoples Choice award, please vote for "Gateway Rock, Garden of the Gods". Here's the link: http://www.outdoorphotographer.com. The grand prize winner will be announced in February. COMMENT: A storm was brewing that October day, but that was ok, since it just added more drama to the shot. Cloud cover, by the way, helps provide more color saturation for color images. COMMENT: Some friends and I decided to head up to the Mountains near Cripple Creek and play in the snow. This scene struck me as we walked by as one that should be saved. I think I almost saw a human quality to the snow covered spruce on the right of the aspen. It seemed like it was hugging the large aspen as if to protect it from the cold. One of my rare ventures into black and white photography. COMMENT: This is what you may see in late July. A waterfall at the top of the bowl (posted earlier) feeds a creek that flows through the basin area, which in turn feeds many species of wildflowers, including indian paintbrush, sunflower, mountain bluebell, lupine, and columbine. This image offers a view of Red Mountain in the distance. LOCATION: Cottonwood Lake, Buena Vista, Co. COMMENT: The texture of the old, gray wood in a bed of fall colors makes this an interesting study in nature. I'd like to introduce you to my all-time favorite solo guitar player, Tommy Emmanuel. Tommy is Australian and has performed all over the world, starting when he was a kid with his family. He was a member of several rock bands in his youth, and playing electric guitar, he was as good as it gets. Somewhere along the line, he decided to go solo and started performing on the acoustical guitar. He was deemed "Certified Guitar Player" by Chet Atkins. To check out his website, you can go here: http://www.tommyemmanuel.com/. Here, you can order any of his cds or listen to samples of his music. You can also find his concert schedule and see if and when he will be in your area. In this video, Tommy performs Guitar Boogie in his memorable style of showmanship and humor. He demonstrates aptly why he is a guitar picking virtuoso. His performances are so amazing not only because of his versatility but because he is capable of providing his own accompaniment while playing the lead melody. Sunrise deepens the color in the wood of this hundred year old barn, one of two in this pasture area. 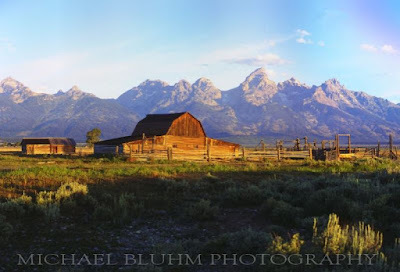 With the Grand Tetons as a backdrop, everything looks dramatic in this light. Occasionally, buffalo will roam into the view here, but unfortunately, not on this morning. I try to get as many layers as I can, meaning different elements of either color, lightness, darkness, or texture layered together from foreground to background. It worked well in this shot, even without the buffalo. LOCATION: Near Buena Vista, Co. COMMENT: Taken on an overcast day last October 2008. This pond is not far from Cottonwood Lake and the whole area is a great location for seasonal photography. COMMENT: If you have never been to Colorado Springs, make sure you schedule a tour of this beautiful park. The sandstone rocks in the distance are huge. Walking trails will take you right next to them or you can tour the entire park from your vehicle or on a bike. The Ute Indians regularly camped on this site and used it for their pow wows. If you look real closely at the rocks you will see the faces of these great people etched by nature in the rocks. (I'll show you what I mean later) The uprooted tree in the foreground is a one-seed juniper. These plants are among some of the oldest living plants on earth. COMMENT: Ever so often, I get a chance to help our resort's A/V department with camera work. ZZ Top was in town for a concert and the resort was contacted for a golf reservation from Frank Beard, the drummer. He was very cordial and allowed us to take some pictures prior to and during his teeing off. Ironically, Frank is the only member of ZZ Top that doesn't have a beard! You can listen to their smash hit, La Grange, in my Playlist below. One of my favorite electric guitarists. This song is called "Manhattan". Also check out his big hit, "Cliffs of Dover" from his album Ah Via Musicom on my music list. COMMENT: In relation to Yankee Boy Basin, this basin is similar, but not quite as well-known. That is what is appealing about this location. I've visited it twice, and both times no one else was there! I almost feel guilty about letting you in on this. What a gem! This creek is one of two in the area. It was taken in July, but because of the elevation, you can still see patches of snow to the left and just to the right of the falls. Many, many wildflowers here. Again, access is made with a 4-wheel drive vehicle. An adjacent dirt road will take you all the way to Telluride. LOCATION: Grand Tetons National Park, WY. COMMENT: My first visit to this national park, which is adjacent to Yellowstone National Park. I'd like to return some day and get a sunrise shot of this view. I suppose a goal of mine when I retire would be to visit all of the national parks in the country. These are special places. We live in a country of such diverse beauty! COMMENT: For those unfamiliar, a slot canyon is a very narrow canyon normally formed in sandstone by many years of flooding waters. Antelope is located on Native American property and the only way to get to this canyon is in a vehicle driven by a Native American. 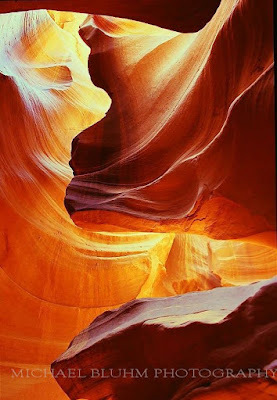 These places offer unique views of sandstone colored by sunlight shining down through the very narrow openings available from above. As was the case here, the best time for photos without flash was when the sun was straight up, or at noon. The abstracts available are endless, but can require some calculation and knowledge of low light photography, especially if shooting on film. In this case, I was using ASA 50 Agfa transparency film. Shooting in low light with slow film requires a tripod for every shot. I found that many of the people in my group that day were avid photographers and the cooperation and mutual respect was amazing. With such narrow walkways and everyone using tripods, we had to take turns taking the pictures in certain areas in order to make sure we didn't walk into the other's timed exposure. I hope to go back some day with my digital camera, which will provide immediate previews. As I continue to add more posts to this blog, you will find that I love music almost as much as photography. Of course, we all have different tastes, but I'll admit, I'm a bit of a romantic when it comes to music. At least when I'm in the mood just to listen, and not dancing! I love the pure tones, the long, drawn-out notes, the background guitars or orchestras, the harmony, and yes, the lyrics. I also appreciate songs sung in other languages. It forces one to listen to the music more than the words and shows that a great song doesn't always have to be in English. I've uploaded a video of Christina Aguilera singing a great song called, "Pero Me Acuerdo de Ti". If anyone out there is fluent in Spanish, I'd love to see the translation to English. COMMENT: Many great pics to be had in this area! 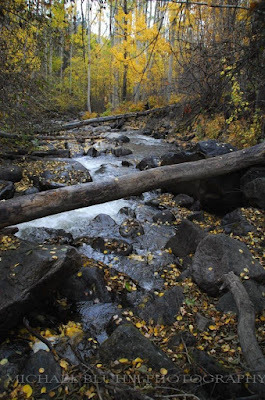 There's nothing like a creek to give the viewer that calming effect of autumn. The aspen leaves collect around the branches, rocks, and eddies in the current, which give this wide angle shot dimension and color. The logs across the creek help tie all the elements together. LOCATION: West of the old gold rush and casino town of Cripple Creek, Co. COMMENT: This scene is on a backroad west of Cripple Creek and it's easy to drive right past it if you don't know it's there. Just out of view to the right is a home and a boat dock. The area is fenced , so I took this picture through the fence. Talk about a choice piece of landscape! COMMENT: So my mission on this field trip was to get a decent lake reflection shot. I didn't have many in my portfolio, and still don't, but I'm happy with the way this one came out. It was calm and the kind of evening when you can see the smoke from campfires around the lake billowing up into the air and there is a strong scent of pine. 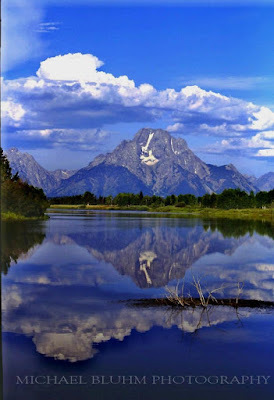 The faint white image of a Jeep Grand Cherokee can be seen on the other side of the lake. I envied those people, but I had already secured a motel room in Silverton and was only here for the photos. LOCATION: Forebay Reservoir above Twin Lakes, Co. COMMENT: Taken in the Fall, as the distant golden hills indicate, the full moon beckoned me to get this image. My best friend Wayne and I were here all day, and when we first arrived, I was taking pictures from the dam next to the reservoir. A female forest ranger drove up and made me get off the dam because it was off limits, mainly from fear of terrorist activity. I did not welcome the negative thought she gave me since I was only trying to capture the beauty of the area, but of course, I obliged her request. She stayed and after a while, she warmed up to us. After talking to us we pretty much learned her life history. COMMENT: This image was taken in October, 2008 on a misty, wet afternoon. 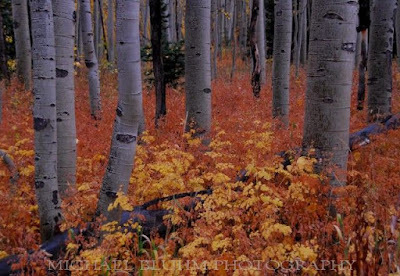 The color of the underbrush was so striking next to the aspen trunks, I thought it offered a different perspective than the usual yellow aspen leaves of the trees themselves. COMMENT: This image was taken in what I call Colorado's Garden of Eden. The water over the falls was heavier when this shot was taken a few years ago than more recently when I revisited this site. Colorado went through a major drought since then, but hopefully, the dry spell has ended. The flowers in the foreground, Indian Paintbrush, add contrasting color and provide perspective to the falls. This is four-wheel-drive country. The first time I visited this area, I owned a Pontiac Grand Am. I used to call it the Jeepiac. But I was not able to take it up where this and other photos were taken; had to walk up a long road. Since then, I've revisited this place several times, but now I own a Jeep Grand Cherokee. I will upload a picture of the Jeep on the road and it will give you a better idea of the area. COMMENT: Shot was taken in late July, which is like late Spring in this area. 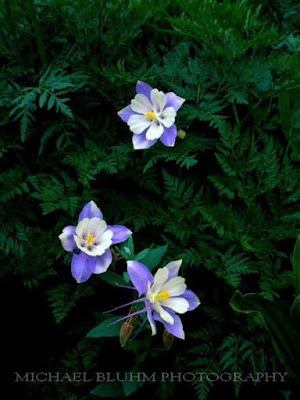 The Columbine is the state flower of Colorado, growing wild in higher elevations. At this location, Yankee Boy Basin, it grows in large groups, sometimes along side other varieties of wildflowers. In this basin, snowmelt brings silt down from the surrounding mountains into a bowl area where the rich soil and moisture grows abundant varieties of wildflowers, ferns, tall grasses, and flowering bushes. This place is pretty much a photographer's dream. I think what makes this image stand out is the contrast caused by the flowers peeking through the ferns. Also the bottom flower, which decided to show its profile in order to be different from the other two.